Treats that your mother makes for you as a child often have fond associations as an adult. My mother often made jam and coconut slice, rolled oat biscuits, jam drops, pusher biscuits, caramel tarts and apple crumble. On a semi-regular basis, she also made peppermint slice, consisting of an irresistable combination of a biscuit base, smooth and icy peppermint filling and rich chocolate topping. Recently, I came across a number of recipes for peppermint slice, and longed to make it to transport me back to childhood - a least temporarily! This slice is very rich, so a small square is more than enough. Preheat oven to 180 degrees Celsuis. Grease and line a 20cm x 30cm slice tin, with paper hanging over the long edges (to be used as a handle to lift out the slice later). Sift the flour and baking powder into a bowl, then add the brown sugar. Add the melted butter and combine. Press mixture into slice tin and bake for 20 minutes. Leave to cool. Melt Copha, then stir in the icing sugar, cream, milk and peppermint essence. Spread mixture over cooled base, then place in the refrigerator to set. Melt chocolate and Copha for topping in a bowl over a simmering saucepan of water. Pour over peppermint layer and refrigerate until set. Lift set slice out of the tin, and cut into 24 squares. Enjoy! 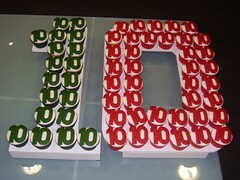 These cupcakes were made by a commercial caterer for my company's 10th birthday today. Although they weren't the greatest tasting cupcakes, they sure were cute! 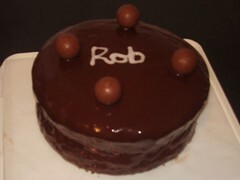 Just to tease your tastebuds, here is a photo of the black forest cake that Sam made for Rob. We had serious chocolate overload in our office today! Today, I attended the inaugural Melbourne Sweet Temptation Expo in the Melbourne Exhibition Building, Carlton Gardens, Melbourne. The Melbourne Exhibition Building was built in 1880, and is grand and beautiful both inside and out. It is set in the Carlton Gardens, an expanse of parkland which stretches out in front of the Exhibition Building. The Sweet Temptation Expo is, as the name suggests, a trade show of various types of sweet treats, including lollies, chocolates, cakes, biscuits and icecream. Because of the nature of the merchandise, I became disinterested in tastings rather quickly, because there are only so many sweets that I can take in one sitting. Below is the stunning Sweet Temptation Express, made by Greensborough Cake Decorating Centre. I love the September 2007 edition of Cuisine, which is full of delicious citrus recipes. A savoury dish which caught my eye is Braised Lamb with Preserved Lemon and Lemon Coriander Jam on page 70. I didn't have preserved lemons, and wasn't going to make the lemon coriander jam. However, the braised lamb itself was delicious, like a thick, rich stew made on the stove top. The dish comprises lamb, onion, celery, carrot, garlic, ginger, lemon peel, potatoes and spinach leaves, flavoured with turmeric, coriander and beef stock. I substituted diced lamb shoulder for lamb stir fry, preserved lemon peel with fresh lemon zest, coriander seeds with fresh coriander, and spinach leaves with baby spinach leaves. Despite these substitutions, made on the pragmatic basis of what I had in the cupboard, I was very happy with the result. This dish was served with boiled rice, and made a very satisfying winter meal. Tomorrow is my colleague Rob's birthday. As with most people at work, I know that Rob likes chocolate. Accordingly, continuing with my series of chocolate cakes, I have made Rob a chocolate mousse cake, inspired by Habeas Brulee's chocolate mousse cake. However, I only followed her recipe for the base chocolate cakes. For the mousse filling, I halved the mousse recipe used by A Cat in the Kitchen for her very different chocolate mousse cake. Finally, I iced the chilled cake with chocolate glace icing, decorated it with Lindt Balls and piped Rob's name on the top in contrasting white icing. An update on how this cake tastes will follow. Postscript: The base cakes were delicious, but I was not such a fan of the mousse filling; this may be primarily because I am not a cream kind of girl . However, the general consensus was that people enjoyed the cake. The autumn edition of Donna Hay Magazine has a particularly enchanting section titled "Secret Garden", featuring recipes that you can make to take on a picnic. The exquisite photographs which accompany these recipes feature two pretty girls roaming through an apple orchard on a very autumnal looking day. One of the recipes featured on page 95 is for individual apple puddings with butterscotch sauce. I love butterscotch sauce; however, given the butter content of the puddings themselves, I could not bring myself to make the sauce as well, comprised as it is of cream and sugar and even more butter. However, I made the puddings to take to dinner at a friend's house tomorrow night, where I plan to serve it with Greek yoghurt. These little puddings are delightful to look at, as the ramekins are lined with apple slices before the pudding batter goes in so that the outside of finished puddings are adorned by the apple slices. In addition, the baked spongy puddings have perfect little domed tops, and smell very pleasant. The puddings photographed in the magazine appear to have been made in muffin tins which is a great idea. I will provide an update on the taste of these puddings after tomorrow night. Postscript: These puddings were light and delicious, with the apple on the outside baking into gorgeous sweetness. The puddings are great on their own or served with Greek yoghurt. How would you like to join the blog world's biggest patio party? When I heard that Ivonne of Cream Puffs in Venice and Lis of La Mia Cucina were hosting La Festa al Fresco for the second year in a row, I couldn't resist the invitation. The concept is simple: prepare a dish using a fresh seasonal ingredient (preferably local) for the patio party. It is winter in Australia, and locally grown citrus fruits and rhubarb are in season. Accordingly, when I saw the fantastic photo of Lime, Orange and Rhubarb Cake on p106 of the September edition of Cuisine, with a subtitle of "Citrus Reigns", I knew that I had found my dish for La Festa al Fresco. As its name suggests, this cake is resplendent inside with lime zest, lime juice and stewed rhubarb, is decorated with orange segments and then drenched in lime syrup. It was a very time-consuming cake, because the oranges must be peeled and sectioned, and then each segment must be stripped of its membrane - while remaining intact! This was quite a challenging task. The cake also took much longer than the one hour stated in the recipe to bake. Despite my oven usually being pretty close on timing for most recipes, and even though I used the correct 20cm sized cake tin, my cake took an hour and a half to cook through to the centre, which stayed stubbornly runny. I was very grateful for the Microplane zester given to me by Katie of Other People's Food in my Blogging by Mail package for the purpose of zesting the limes. It was so quick and efficient using this tool - thanks Katie! Although the finished cake looks quite dark on the outside, don't be fooled - it was moist and perfect under that dark crumb. The rhubarb gives the cake a lovely pink swirl and flavour, and the lime syrup really adds a zingy citrus finish to the cake. Cold is excellent because you really get the full citrus hit ... It is a pretty cake also – the rhubarb makes it look like a pretty tea cake but with the full hit of a dessert cake. I didn't have high hopes that the troops would like this cake, because it is rather different to what I have made before, but it disappeared quite quickly! I think I can safely say that I have a hit. This cake would be perfect to serve at a winter dinner party, served warm with Greek yoghurt (as suggested by the author). However, I also think it would be great served cold sliced into generous wedges at a picnic - or of course, at a patio party! Thanks to Ivonne and Lis for organising La Festa al Fresco - I look forward to "attending" the roundup on 9 September. Winter has returned with a vengeance to Melbourne, with last night's temperature down to 4 degrees Celcius. Chilly weather calls for warming dinners, and I turned to the Donna Hay autumn edition (Issue 32, which appeared to have lots of post it notes protruding from the top where I had bookmarked recipes of interest). On page 57, there is a striking photograph of Paprika, Chicken and Lemon Bake. Once I had seen this, my choice for dinner was a no-brainer. The recipe for this dish can be found on page 62 of the autumn edition of Donna Hay Magazine. I substituted hot paprika for smoked paprika, as this was what I had in the house. This is a terrific, strongly flavoured dish, featuring lemon, chorizo sausages, olives and paprika. I loved the striking, salty flavours, which really added the "zing" factor to the chicken. This is definitely worth making again, as it is oh so simple (basically just tossing ingredients together with very little preparation), yet packs a big punch. Delicious!! This week, another member of our team, Steve, left us for greener pastures. As his last day was Friday, this tied in nicely with my regular baking day. Since acquiring Sweet and Savoury Bites, I had been eyeing up the hummingbird cake on p202, and with bananas no longer priced like truffles and caviar (as they were last year after Cyclone Larry wiped out the North Queensland banana crops), I wouldn't be required to take out a second mortgage to do it. As with many popular cake varieties, there are a multitude of different recipes for hummingbird cake. However, all of them contain crushed pineapple and mashed banana with cream cheese frosting. I have to say that I am not a huge fan of cakes containing banana - I have no idea why, as I like bananas on their own, on bread, and with icecream, yoghurt and custard. However, a lot of people like the moistness of banana cakes, so I figured it was a safe bet to make this cake for work so that I could satisfy my curiosity about making it. When I went to make this cake, I found that I had purchased pineapple pieces instead of crushed pineapple. This made the pineapple component of the cake a little chunkier than it should have been, but ultimately, it didn't affect the resulting cake. I once again had some decorating challenges. Despite being out of the fridge for a couple of hours, the butter didn't smoothly blend into the frosting, giving it stubborn lumps which refused to go away (although these lumps settled out overnight). I also found the frosting a little runnier than I think it should have been, although I used the quantity of icing sugar called for in the recipe. This made the process of icing the cake rather messy. Next time, I would add more icing sugar to make the frosting thicker. Finally, my "plastic" icing decorations remained stubbornly on the pink side, even though I was using red paste colouring. I lost interest in trying to remedy this after a while, and I think it looks OK anyway (although pink for a masculine cake is not a great look). From a personal aesthetics perspective, I was also not 100% happy with the rather child-like presentation of the plastic icing letters. It really was like making play dough! On the up side, I was pleased to have been able to use some of the ideas that I got from a short cake decorating class that I did, including making the little spirals at the top of the cake by wrapping strips of plastic icing around the handle of a wooden spoon. This cake tasted fine, although as I said, banana cakes will never be top of my favourites list. Steve mentioned that this was his first personalised cake, which made the effort of making the plastic icing decorations well worth it. As with most suburbs, there are "good" and "bad" parts of St Kilda. There is a distinctly edgy feel to parts of St Kilda, which has a chequered history. However, St Kilda also has some unique and charming areas, which make it a fun place to visit on the weekend, when the tourist trade hits its peak. Despite the enticingly beautiful appearance of these cakes, I know from experience that for the most part, they do not (in my humble opinion) taste as good as they look. The European cakes served in these shops are generally very heavy, and it is advisable to buy a slice to share rather than attempting to battle them on your own. They also rarely taste how you would expect, although I do not mind the German-style cheesecakes and traditional fruit and custard tarts. Pictured below is the lemon pie that I purchased on this occasion. The crust of this pie was gorgeous, consisting of a light, flaky, honeyed pastry with flaked almonds on top. However, the filling was not, as I had hoped, a light whipped custard (akin to a French vanilla slice), but heavy and overwhelmingly creamy. To avoid offence, I spirited the majority of the filling of this pie into the nearest bin in my napkin. I love St Kilda because it (a) is by the sea; (b) has wonderful quirky and sometimes beautiful architecture; (c) has a great craft market on Sundays by The Esplanade, where I often buy gifts for my friends; and (d) was the home of one of my favourite TV series, The Secret Life of Us. (My favourite character was Evan, despite the fact that in the real world, an Evan type would be the very opposite in most respects of what I would want in a boyfriend.) If you are travelling to Melbourne, or are a native Melburnian who has not been for a while, I highly recommend making the journey to St Kilda and spending a few hours walking down the pier or along the beach, savouring the unique architecture, and trying out some of the many places to eat (even if it is just fish and chips on Acland Street, like me!). Just like this 1930s advertisement says, St Kilda really is beautiful! This month, Sugar High Friday is hosted by The Passionate Cook, and the theme is "Going Local" - that is, a speciality that is local to the region where you live. There are not very many Australian specialities that I can think of, primarily because we have borrowed heavily from the early British settlers for most of our sweet treats. However, one undeniably local sweet treat that is adored by the majority of Aussies is the humble lamington. A lamington, for those of you who may not know, is a small sponge or butter cake in a square or rectangular shape which has been dipped in chocolate icing and then rolled in coconut. Lamingtons may be unfilled, or filled with jam or cream (or both!!). The history of the lamington is hotly disputed, and you can read about the various stories surrounding the creation of the lamington here and on page 8 of this brochure. Regardless of which of these stories you choose to believe, one thing is fairly certain - the lamington is a Queenslander, just like me! One of the towns in which the lamington was reputed to have been created is in fact my home town, making me feel an even closer affiliation with this very Aussie treat, which is served to new Australians at citizenship ceremonies. Preheat the oven to 180 degrees Celsius, and grease and line a 9 inch square baking tin. Sift the flours into a bowl, and add the butter, sugar, vanilla, egg and milk. Beat until well combined and increased in volume. Pour the batter into the prepared cake tin, and bake for approximately 50 minutes. Cool the cake in the tin for about 5 minutes before turning onto a wire rack to cool completely. The end result is 16 delicious, light, sweet cakes that are crowd pleasers (I took mine to work to share, because one girl and 16 lamingtons is a dangerous combination). Enjoy! 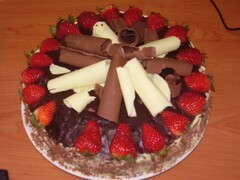 Thanks to Johanna from The Passionate Cook for choosing this great theme for Sugar High Friday. I look forward to seeing the global round up! On Sunday, it was my friend Veronica's birthday, so her friend Margot and I took her to breakfast at Richmond Hill Cafe and Larder. This cafe is a Melbourne institution, and needs no introduction. The food was just marvellous, and well worth the 40 minute wait for a table. Veronica had pancakes with pears, cardamom, cassia and blood orange curd, Margot had the fruit toast and I had porridge with, among other things, pumpkin seed brittle. The food tasted as good as it sounded on the menu, and was very filling. A wonderful range of gourmet jams and relishes, cheeses and breads are also on sale at the cafe. For afters, I made Gateau Chocolat Framboise (or Chocolate Raspberry Cake for those who, like me, don't speak French!) from p209 of the delightful Clotilde Dusoulier's Chocolate & Zucchini recipe book. This cake, pictured above, is more akin to a shell-less chocolate tart than a cake. It is extremely dense and chocolatey, containing almost an entire block of chocolate and plenty of butter. However, as you can only manage a small slice of this melt-in-the-mouth, fudgy delicacy, you do not have to worry about your waistline. The raspberries give the cake a little bit of zing to contrast with the intense chocolate taste. My cake does not look as elegant as the one in Clotilde's photograph, primarily because I had to ice it to cover up a failed attempt at piping Veronica's name in white chocolate on the top. No matter - it tasted delicious, and Veronica loved it. 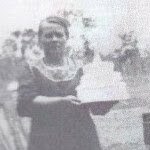 If you choose to make this cake, you need to be prepared well in advance, as it must be refrigerated for at least 8 hours. Don't attempt to lift the cake from its springform pan base until it has completely chilled - I found to my peril that this cake is rather fragile until it has chilled and I almost lost it. While it is not a cheap cake to make, with ample quantities of chocolate and raspberries being crucial ingredients, it is well worth it for a special occasion, and the taste is sinfully devine. Happy birthday Veronica!! After a run of relatively warm weather (well, warm for Melbourne in winter! ), it has turned chilly again today. Accordingly, warm, rich comfort food is what the doctor ordered to keep out the cold. The Winter 2006 edition of Donna Hay Magazine features a selection of delicious pie recipes, so I dug out my copy and selected the Beef and Potato Pie for my dinner tonight. This pie is non-traditional in that, instead of a pastry crust, it has a crust of thinly sliced baked potatoes. The beef filling is also unusual in that its key flavour comes from seeded mustard, giving the filling a distinctive smell and tangy flavour. Other ingredients accompanying the mustard flavoured beef are onion, garlic, mushrooms, bay leaves and beef stock. The filling takes one hour on the stove top to simmer (half an hour with the lid on, half an hour with the lid off), followed by 45 minutes in the oven to bake the potato topping. Once the filling has reduced on the stove top, you are left with a thick, tangy, flavoursome pie filling. However, I wasn't so keen on the potato topping, which seemed rather bland to me. This recipe tells you to put the oven on to warm up at the start, despite the fact that the filling takes over an hour to prepare before it goes into the oven (grr...). Next time, I would also season the potatoes (the recipe doesn't call for this), or use a pastry crust for the delicious filling. However, the filling recipe is very good, and I would make it again. I have just joined the Foodie Blogroll, a clever innovation by the Leftover Queen to promote and grow the food-related blogging community. You can join the Foodie Blogroll by clicking here, and you can link to the many terrific blogs on the blogroll itself on the right hand menu bar of my blog. When I set out to make self-saucing chocolate pudding, I actually meant to make a gloriously rich version containing chocolate and sour cream. Unfortunately, when I went to make it, I didn't have enough chocolate, so I did the next best thing - I made the saintly low fat option made with cocoa instead. This pudding recipe comes from p284 of The Australian Womens Weekly 501 Low Fat Recipes, and is titled "Rich Chocolate Self-Saucing Pudding". Although it is nice, particularly when it is hot, I would hardly describe it as "rich". If you can afford to go the whole hog occasionally, my recommendation is to make the full fat version and enjoy it with icecream and custard. However, for those watching their weight or who just don't have the right ingredients to make a real chocolate version, then this is a pleasant enough substitute. I'm going to a friend's place for dinner tomorrow night, so I have decided to bake for work on "hump day" - Wednesday - instead. I received a gift voucher from work for my baking efforts and used it to buy two new cookbooks. One of these books, Sweet and Savoury Bites, contains a recipe for the intriguingly-named Lumberjack Cake at p66. 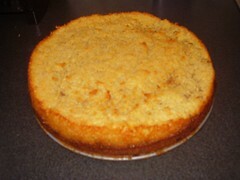 Full of the fruity goodness of Granny Smith apples and dates, and topped with crunchy coconut, I found it hard to resist. This cake is deliciously moist and more tart-like in texture than cake-like. It was also quite sweet because of the large quantities of fruit that it contains. This cake did not receive the same rave reviews that a chocolate cake does, but I enjoyed it for a change. There are a number of other fruity cakes that I have been wanting to try, so this may be the beginning of a new phase. This is simply a gratuitous chocolate post to show off the two new flavours of chocolate that I bought on the weekend - Kiwi Fruit and Spicy Ginger, made by Whittakers, a Kiwi brand sold at Big W. I haven't broken into either of them yet, but as I am a chocoholic, and I already know that I adore ginger chocolate, I would be very surprised if I am disappointed by either of them. Enjoy! 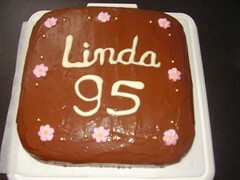 Wonderful Patsy from work asked me to make her mother-in-law's 95th birthday cake. I was very honoured, as (a) it was such an important occasion; and (b) no-one had ever asked me to bake a cake for them before; and (c) I was amazed that anyone thought my baking skills were good enough to be entrusted with such a task. I made the Dinosaur Rock Chocolate Cake again at Patsy's request - it is both a large cake to feed crowds, and is very moist. However, it did not go smoothly this time - I ended up making two identical cakes, with the first one providing morning tea for the people at work. Cake no. 1 was turned out too early and started to crack because I forgot to factor in the size of the cake to the tin cooling time. This of itself was not the deal-breaker for this cake, as I could cover up the crack with icing - it wasn't that major. However, I thought I would use ganache for the icing, not realising that such a large cake needs a longer than usual cooling time before being iced - when I woke up the next morning, the ganache had marbled from the heat. This could not be so easily fixed, so I started baking cake no. 2 at 7am before going to work, and went home at lunchtime (luckily I live really close to work) to ice and decorate it. Happily, cake no. 2 went much better, although I skipped the ganache and used glace icing (which perhaps I should have done in the first place). Patsy said that the cake went down well, and she seemed happy with it (which is after all the most important thing). As well as being remunerated for the cost of the ingredients, Patsy gave me a lovely box of Lindt ball chocolates for my efforts. Thank you Pasty for having faith in me (although I am not sure it was deserved! ), and for providing me with my first commissioned work.